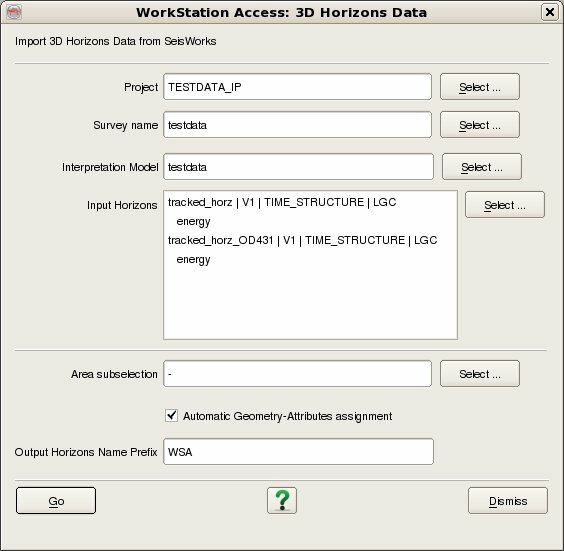 To import 3D Horizon data, select Survey - Import - Horizon - SeisWorks - 3D. The top part of the user interface corresponds to the SeisWorks access, where it is needed to specify the SeisWorks Project, Survey name, Interpretation Model and select the Input Horizons that you wish to import (For multiple selection of horizons hold the Ctrl key while selecting). A SeisWorks Geometry 3D Horizon together with multiple SeisWorks Attribute 3D Horizons can be imported into a new or existing 3D Horizon on OpendTect. Automatic: The SeisWorks Geometry and Attribute 3D Horizons are filtered by its name, version and interpreter into the OpendTect 3D Horizons. This means that from the selected SeisWorks Geometry and Attribute 3D Horizons, the ones that have the same name, version and interpreter will all be imported into the same OpendTect 3D Horizon. Manual: The SeisWorks Geometry and Attribute 3D Horizons are assigned into the OpendTect 3D Horizons by the order of selection. This means that from the selected SeisWorks 3D Horizons, starting from the first SeisWorks geometry 3D Horizon that was selected, all the SeisWorks Attribute 3D Horizons that were selected between two SeisWorks Geometry 3D Horizons are imported together with the first SeisWorks Geometry 3D Horizon into an OpendTect 3D Horizon. 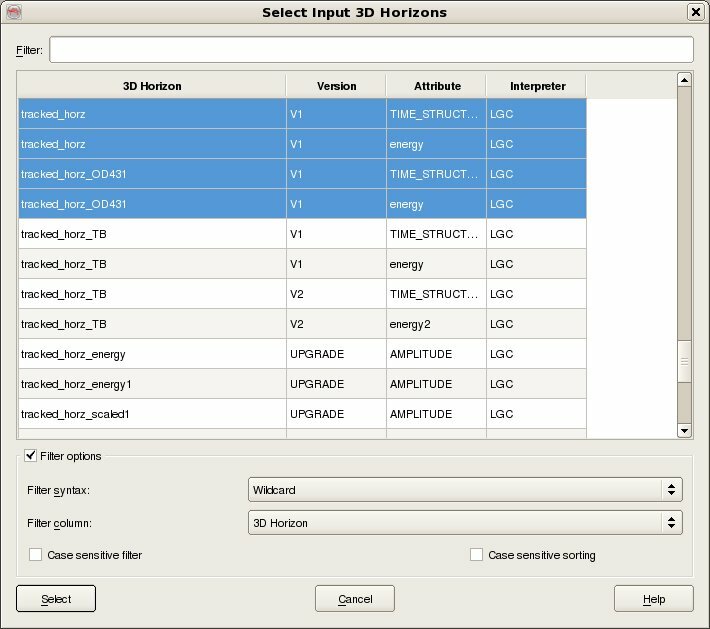 The bottom part of the user interface corresponds to the OpendTect access, where you need to specify the Output Horizon Name for the case of none or single SeisWorks Geometry 3D Horizon import, or the type of assignment for the selected SeisWorks 3D Horizons and the Output Horizons Prefix for the case of multiple SeisWorks Geometry 3D Horizons import. You can select the full volume or a sub volume by using the Area subselection option.